Posted by admin in Africa, Congo (Dem. Rep.), Nyamuragira, Nyiragongo, volcano monitoring. Volcanic neighbours Nyiragongo and Nyamuragira in the Democratic Republic of Congo have been restless lately: Nyiragongo produced thermal anomalies (probably from lava lake activity) and a diffuse plume at the end of January, while Nyamuragira began the new year with a sizeable and dramatic eruption. The city of Goma (estimated population 1 million) lies in the shadow of Nyiragongo. It’s the task of the Goma Volcanological Observatory to monitor these active volcanoes and keep the surrounding population and the wider world informed as to what they are up to – a task made no easier by the various problems of war, population dislocation and economic difficulty that beset this part of Africa, and by the problems in getting the money and equipment they need to do their vital work effectively. Today IRIN, the humanitarian news and analysis service of the UN Office for the Coordination of Humanitarian Affairs, has published an article about the work of the Goma Volcanological Observatory: ‘DRC: watching the volcanoes’ (the report can also be found at Brunei.fm). The more that is known about the work of the Goma observatory, and the more support it receives, the better. Posted by admin in activity reports, Africa, Congo (Dem. Rep.), eruptions, Nyamuragira, Nyiragongo. As well as helping to validate information from different datasets, the satellite images are providing invaluable information about the situation, such as the details about the lava flow and the fact that the Nyiragongo volcano is not showing any signs of abnormal activity. This has been of great importance for the local authorities and the Goma Volcano Observatory, who are holding daily crisis meetings, to reassure the local population and humanitarian agencies that Nyiragongo will be unaffected by the eruption of Nyamulagira. Meanwhile, from ground level, the gorilla.cd blog offers a gorilla’s-eye view of the Nyamuragira eruption with some pictures of lava fountain activity taken from the Gorilla Sector of Virunga National Park. Posted by admin in activity reports, Africa, Congo (Dem. Rep.), Nyamuragira, Nyiragongo. Following recent reports of activity at Nyiragongo volcano in the Democratic Republic of Congo, scientists at the Goma Volcanological Observatory are warning that an eruption may be ‘imminent’ at both Nyiragongo and its neighbour Nyamuragira (alternative spelling Nyamulagira). A field trip to both volcanoes revealed tremors, emissions and ‘pools of lava’, and Dieudonne Wafula, head of the observatory, is quoted by the UN’s humanitarian news network IRIN as saying that ‘The volcanoes could erupt any time; it could be in two days, or a week or two but not later than two months from now’. Wafula warned that the city of Goma could be threatened by any eruption, but said that lava levels at Nyiragongo were low, reducing the chance of severe damage to the city. UPDATE: The BBC has picked up on the story, reporting that Mr Wafula thinks Nyamuragira is more likely to erupt than Nyiragongo, and suggesting that the residents of Goma are well used to their local volcanoes and have rather a blasé attitude towards their lava flows, fumes, ash emissions etc: ‘A resident of Goma told the BBC said people were talking about the volcanoes and that they had noticed a rise in temperature in recent days, but that otherwise the situation inside Goma was normal’. Posted by admin in activity reports, Africa, Congo (Dem. Rep.), eruptions, Nyiragongo. Analysis summary: The satellite-detected thermal anomalies on the Nyiragongo volcano are centered over the main crater and extend up to 3km along the eastern and western slopes. These thermal anomalies are likely to represent active fires and/or volcanic material on the surface of the volcano, and have been identified on six separate days over the time period 10 April – 4 May 2009. The MODIS satellite image below recorded on 4 May shows [a] volcanic eruption in progress, with a primary westerly outflow direction. This is a preliminary assessment and has not yet been validated on the ground. 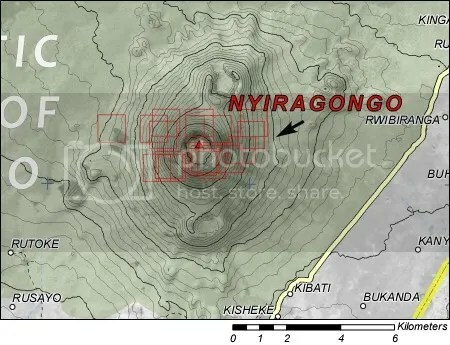 UNOSAT have also mapped the hot spot areas onto a map of the Nyiragongo area. Below is a detail of the volcano itself, showing the red outlines of areas where MODIS has detected heat sources. The full map is available via the UNOSAT links above. 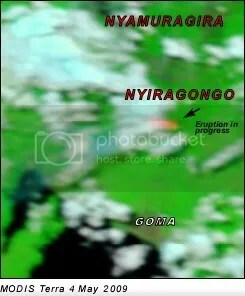 There have been reports of restlessness at Nyiragongo (and its neighbour Nyamuragira) since March this year. The University of Hawaii MODVOLCS site shows thermal anomalies at Nyiragongo on several occasions during April and early May, and the SI/USGS Weekly Volcanic Activity Report for 1-7 April 2009 gave details of lava lake activity and lava fountaining at Nyiragongo, among other signs of heightened activity. The MODIS evidence published by UNOSAT indicates that some lava has been erupted over the last 24 hours. Nyiragongo is potentially a very hazardous volcano in a densely-populated and troubled region, and future developments need to be carefully monitored. UPDATE 7 May 2009. Pierre Vetsch of the Société de Volcanologie Genève reports (see comment here) that according to a contact in Goma, Nyiragongo volcano is in a ‘normal state of activity’ with no lava eruption on the flanks. Reuters is reporting today that heightened seismicity has been registered at Nyiragongo and Nyamulagira volcanoes in the east of the Democratic Republic of Congo. Dieudonne Wafula, head scientist at the Volcanological Observatory of Goma (which has no website), told Reuters: ‘There is heavy activity around Nyiragongo, but it’s more centred on Nyamulagira … The risk is greater for the villages west of the Nyamulagira volcano’. Walufa said that the low level of lava in the Nyiragongo lava lake meant that the city of Goma, extensively damaged (with many fatalities) in the most recent eruption of Nyiragongo in 2002, was less at risk on this occasion. The local Red Cross is on the alert to assist the local population in the event of an eruption. Political instability and fighting in eastern DR Congo have led to the already heavily-populated region around the volcanoes becoming home to thousands of refugees. There’s more on this at Eruptions. Posted by admin in Africa, Congo (Dem. Rep.), current research, geoscience, Nyiragongo, volcanology. The highly fluid, fast-moving lava produced by Nyiragongo volcano in the Democratic Republic of the Congo presents a dangerous volcanic hazard. In January 2002 the volcano erupted 14–34 × 106 m3 of lava from vents on its southern flanks, engulfing thousands of buildings in the nearby city of Goma and surrounding villages, killing about 50 people and leaving 120,000 people homeless. Twenty-five years earlier, in January 1977, a large death toll – possibly in the hundreds, and thought by some to be in the thousands – resulted from a similar eruption which produced lava flows with peak speeds estimated at 100km/h. Basu analyzed the lava, which resides in the world’s largest lava lake—more than 600 feet wide inside the summit of Nyiragongo—and found that the isotopic compositions of neodymium and strontium are identical to ancient asteroids. This suggests, says Basu, that the lava is coming from a place deep inside the Earth where the source of molten rock is in its pristine condition.